I did that ‘judging a book by its cover’ thing again with another anime. 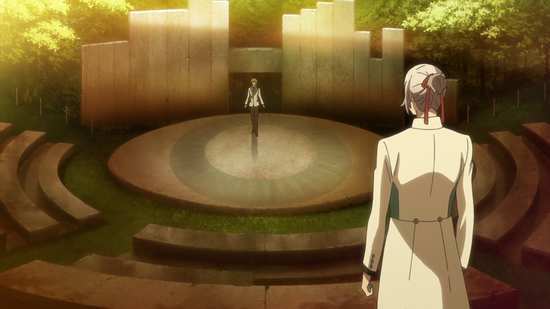 This time, I had my preconceptions about Starmyu set by the trailer I had seen of it on other anime discs. Starmyu’s trailer isn’t all that informative. 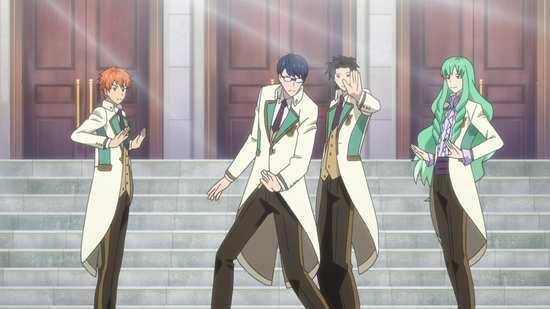 Five pretty boys, singing and dancing, it looks like a gender switched idol show. There is a tendency in the industry to take popular premises and gender switch them to appeal to the opposite demographic, and if you’ve seen one done, it can look mighty obvious and contrived. ‘Cute girls doing cute things’ was a KyoAni stock in trade at one point, with shows like K-On! and Chunibyo, so when they made Free featuring five cute guys doing cute things in a swim team, it was exceedingly obvious. 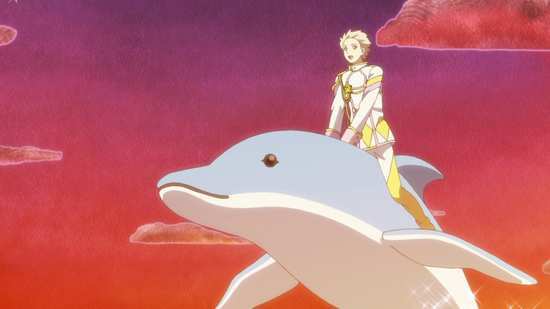 Quite frankly, I wasn’t in the mood to watch a gender switched Love Live, and Starmyu went on my review pile as another show I had to sit through to get to the good stuff. Only it turns out that Starmyu isn’t a gender switched idol show. Yuta Hoshitani has wanted to be on stage ever since he saw an elegant student rehearsing in the rain. Naturally he gets into the same school, Ayanagi Academy, but this is a school for elites, where those with the right backgrounds are driven to excel. Yuta’s just a ‘commoner’, yet from the start he aims for the top, trying to get into one of the school’s Star Teams, first year students mentored by the best students in the school, the members of the so called Kao Council. The Kao Council members are select, picking the best of the best, and someone like Yuta isn’t likely to meet their high standards. 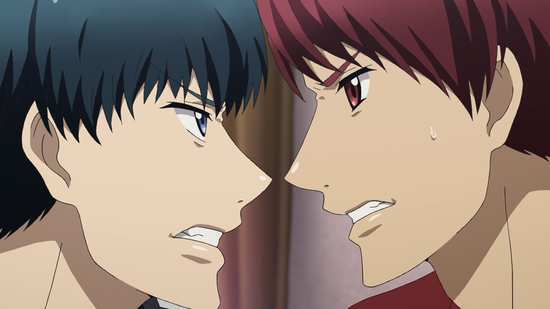 But the Kao Council does have its maverick, Itsuki Otori, and for his Star Team, he picks five students who failed the conventional auditions, and Yuta is someone who caught his eye with his raw, amateur talent. But getting on a Star Team is just the first step on the road to musical theatre. 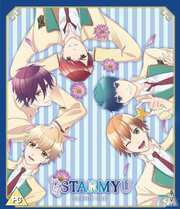 The twelve episodes of Starmyu Season 1, titled Acts 1 to 12 are presented across two Blu-rays from MVM in a 9-3 split. The 1.78:1 widescreen 1080p transfer is the usual effort from Funimation, bright, clear and colourful to look at, with nice smooth animation at first glance. But then the digital banding appears, and once you see it, you can’t unsee it. 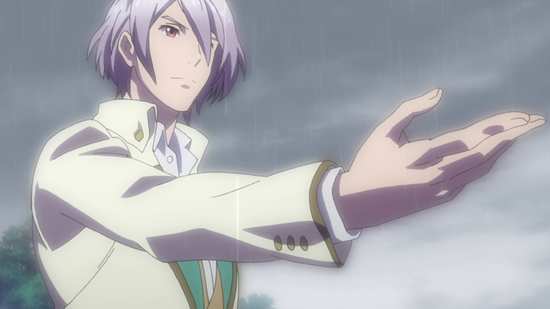 Starmyu is a show aimed at the female demographic, and it’s replete with tall elegant pretty boys, a gentle and bright colour palette, and a world design in keeping with the story aesthetic. The sole audio track with this release is the Dolby TrueHD 2.0 Stereo Japanese track with player locked English subtitles. That’s understandable given how many songs there are in this show, and the alternatives of having an English dub but leaving the songs in Japanese or shelling out on rewriting and re-recording the songs would either be unsatisfying or expensive. The actor voices in the Japanese are suited to the characters, if somewhat predictable and generic, while the songs work for what they are (don’t expect hi-fi production values). The subtitles are accurately timed and free of typos. The discs present their contents with static menus. Disc 1 autoplays with a trailer for Ultimate Otaku Teacher, disc 2 with a trailer for Free Eternal Summer. The extras are on disc 2 and comprise the textless credits, 1 opening and 2 closings, and trailers for Shonen Hollywood, Attack on Titan Junior High, and Show By Rock. Musical theatre! I was fooled by the audition scenes in the first episode. I thought this might be a drama set in a school of performing arts, an anime version of Fame. I thought that there might be the whole spectrum of theatre, not just the song and dance. Y’know, some acting. 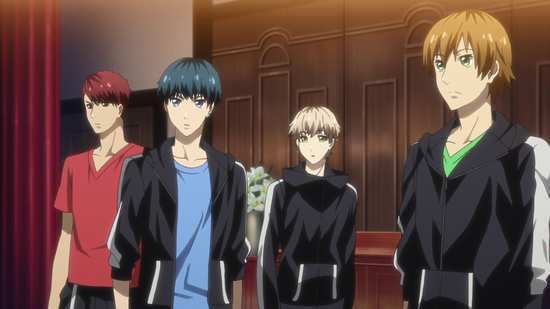 But Starmyu is all about the song and dance, five boys, forming a group and performing in competition against other groups of five boys each. In other words, it’s a gender-switched idol show. It really is that simple for the creators, take an idol show template and just switch genders. Of course that results in characters that just don’t exist in any sane world. Take the main cast of five for example, team Otori. Yuta Hoshitani is the leader of the group, and he’s the peppy, perky, ever optimistic mood maker of the group. Toru Nayuki is the baby, nervous and prone to stage fright, the heart of the group, and who tends to cook for his friends. 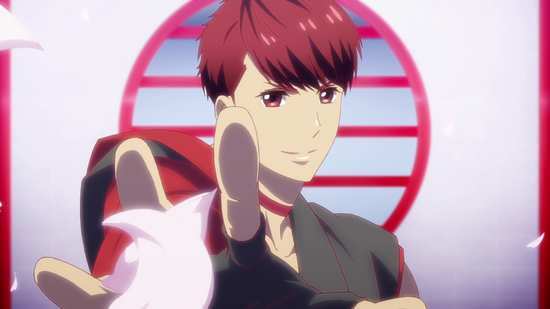 Kakeru Tengenji is the diva, the talent who doesn’t suffer fools gladly, but has a soft gooey centre and a cute pat cat, in other words a classic tsundere. 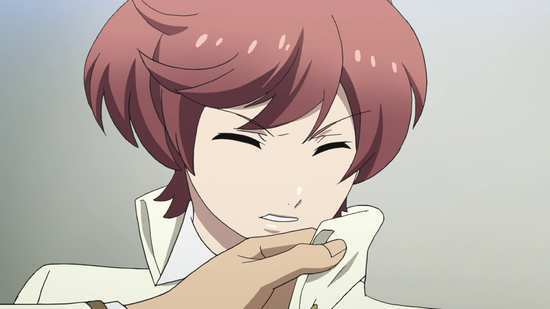 Kaito Tsukigami is another brusque character who mellows once he gets to know his friends, but has a complex about his more talented older brother. 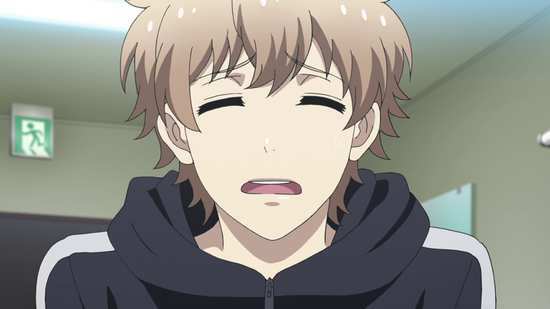 Finally Shu Koga is the man of few words, the most independent and self-reliant, and turns into the big sister type. There are no men like this on the planet anywhere, prone to burst into histrionic tears, the kind of boys who have to girly squee and hug in fearful situations (the bear in the storehouse sequence is a prime example). Starmyu depends on whether you can suspend your disbelief regarding the characters long enough to invest in them, to get into the story. I certainly couldn’t, but then again, I’m not in the target demographic. Characterisations aside, the story is pretty solid. You have an elite school that hones musical theatre talent (even though we only see the song and dance side of it), and like most Japanese schools in anime, there are no teachers, only a student council, in this case made up of the top students in the third year. These five top students, themselves the best Star Team in the school at one point, wind up sponsoring a Star Team each with the new year of students, alongside the regular teams. Those who want to excel at their craft do their best to get onto a Star Team through auditions at the start of the school year. One of this year’s Kao Council, Itsuki Otori is a maverick, an outsider and he chooses five students who failed the audition, but who seem the most individualistic and talented in his eyes, our five protagonists. The first challenge is getting these five initially antagonistic personalities to work together as a team, and then the rest of the series follows them as they strive to excel as a Star Team in a school where they are regarded as losers with no hope of succeeding, and with all the odds stacked against them, especially from the other members of the Kao Council. In terms of episodes, there is plenty of interpersonal drama and moments of comedy, and there is room for at least one song and dance number in each episode, although I have to admit that I wasn’t impressed by these. The comic moments, the occasional drama, the eventual triumph through adversity; it’s all standard for this genre of anime. The high school setting has its usual tropes, most notably the summer training camp and the culture festival. Starmyu is fairly mediocre stuff, but it hits all its tropes with confidence and enough aplomb that it doesn’t really put a foot wrong, and that has apparently been enough to ensure its audience does indeed invest in the characters and their stories, despite the obvious and clumsy gender switching. Forget the second season; a third season is due to air this year. This is probably not all that we’ll see of Starmyu on UK home video.